Animal welfare campaigners will be demonstrating in Ramsgate for the third time this week as yet another shipment of live-export sheep is brought to the port. Three lorries carrying some 2,000 sheep are expected to arrive this evening. 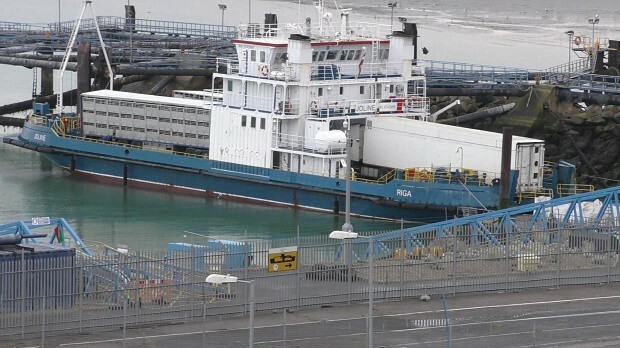 The animals are due to be transported to Calais aboard the Joline vessel. Protestors will gather at the Royal Harbour Approach roundabout. Live export is the commercial transport of live farm animals across national borders. The expansion of the trade has been supported by the introduction of purpose-built ships which carry large numbers of animals. There has been strong criticism of the industry on animal rights grounds. Campaigners have been criticised for obstructing the lorries with concerns that the noise of protests will further upset the sheep. 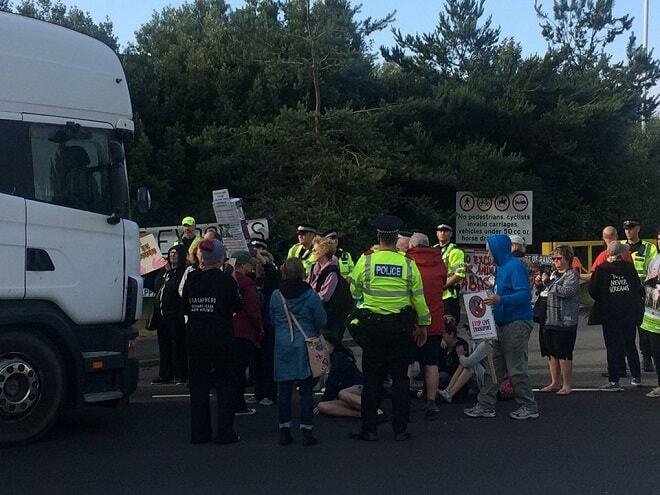 A spokesman for KAALE (Kent Action Against Live Exports) said: “The suggestion that everyone should stand on the footpath as the lorries pass is not viable: we need them to stop in order to obtain video and photographic evidence of the numerous animal welfare violations. “Sick sheep are often transported, for example some on the last sailing were suffering from profuse infected nasal discharge, and severe coughs. There are concerns about noise upsetting the sheep. Nobody shouts or bangs on the trailers. I obtain video footage at each sailing and can confirm that sound is muffled by the fans in the trailers (when they are working) and the engine noise. “Many of the sheep approach willingly as we film. They lick our hands and are not afraid. Filming is always done carefully to avoid causing distress but it is essential to do it to obtain the evidence which we pass onto the relevant authorities. Extensive evidence has been included in the Government Consultation implemented by Michael Gove. The organisers of KAALE have been up to the Houses of Parliament twice this year, by invitation. “When the protests began at Dover 23 years ago, 30-plus lorries per day went through. Without the dedication of those standing up for the welfare of these animals, we would still be looking at these high numbers rather than a dwindling trade which peaks in line with the annual demand for sheep at this time of year. 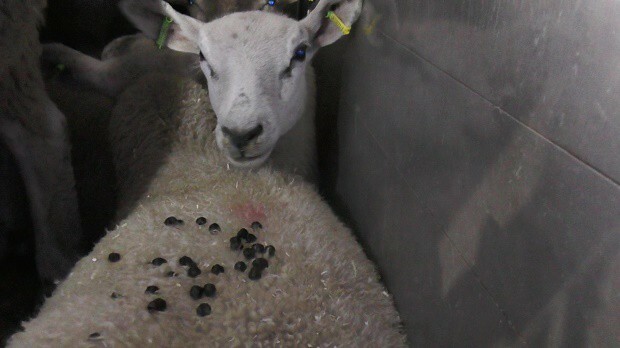 “Without photographic evidence of animal welfare breaches by the exporters, we would have no proof. The lorries are only held up briefly to enable us to see and film inside. The argument that this increases journey times is unfounded: the sheep have already travelled for several hours before arriving in Ramsgate, often from Cumbria. When they leave the UK, they spend at least 4 hours at sea and then continue for further hours by road once they have arrived in France. Once they leave our shores, these animals are not protected by UK welfare standards and often suffer agonising deaths, with no pre-stunning. “During the journey, they are not afforded the same transport standards as breeding animals which have a high financial value. Breeding animals would not be carried on a lorry with drinkers not working and the stocking density of breeders is much lower so they have more space. They are transported out through Ramsgate and beyond in both extremes of temperature. The then-ruling Labour group at Thanet council banned exports from Ramsgate after 47 sheep died at the port in September 2012 but they were forced to make a U-turn by the High Court. Local campaigner Ian Driver said in the last 7 years there have been 200 shipments involving more than 500,000 sheep from Ramsgate and Dover. He said a ruling this month in India banning live exports from the country’s ports was a signal that the ‘tide is turning’ against the trade. Wow, I can’t believe the responses here. These poor animals are treated appallingly. They travel for 60+ hours in cramped conditions, thirst, hungry, scared and confused.. What on earth happened to compassion!!!! This trade needs to stop, for the animals and for the residents of Thanet. Animal cruelty, wasting police resources and tax payers money….if you are not in it for the animals at least show your disgust on behalf of your community. The only way this will stop is by banning Live Exports from Ramsgate and the only way this will happen is if we all stand together and fight to get it stopped!!! This is an unnecessary trade supported by PROFIT. Politics and Religion. The UK government approves each shipment and claims it is LEGAL and carried out under EU Animal Welfare Regulations . But two of the transporters since the end of July had no water in the onboard water dispensers, in spite of the Government approval having been ticked as all OK. Earlier this week it was noticed as the transporters were brought to a stop that 3 children were along as Passengers, in the transporters. Who brings their 8 year old daughter along on such a Slaughter trip for a 5 hour channel crossing in a very old Latvian registered open decked barge ?? Government enough rules are being broken on this style of livestock for religious SLAUGHTER FOR YOU TO Ban it now. How much is this costing the taxpayer, how well is it currently being Regulated by the UK ? This trade must be stopped. Have seen the same terrible conditions that these poor sheep are transported in when I worked in Dover by the docks. This live export has to stop. The more aware people are of this cruel trade the better. My vote wont go to a political party who allows animals to be crammed together in extreme heat with no easy access to water for days on end will be voted out by us. . This disgustingly cruel trade must be stopped. My heart goes out to the animals suffering so terribly & to the protesters who voluntarily work all night to obtain evidence. Well done to these protesters I say. It is so important to document the state these poor animals are in prior to the next part of their short misrable lives. 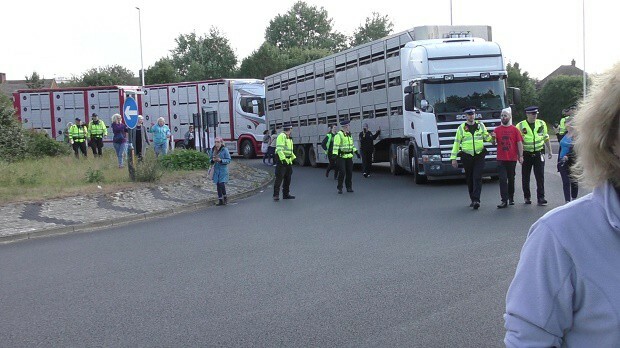 If it were dogs in these lorries instead of sheep all the locals would be standing alongside the protesters in absolute outrage and horror at the treatment of mans best friend. The only relevant difference in the respect, between the sheep and the dog, is purely in our perception of them. Thank you protesters for attending the protests. We want a clean break from the EU after Brexit – only then will we be able to get our MPs to stop this disgusting trade. At the moment we are governed by EU rules so we must force Defra Minister Michael Gove to stop weeping crocodile tears & do SOMETHING for these poor animals . Many countries export live animals. It has nothing to do with whether a country is in the EU or not. You are confused. 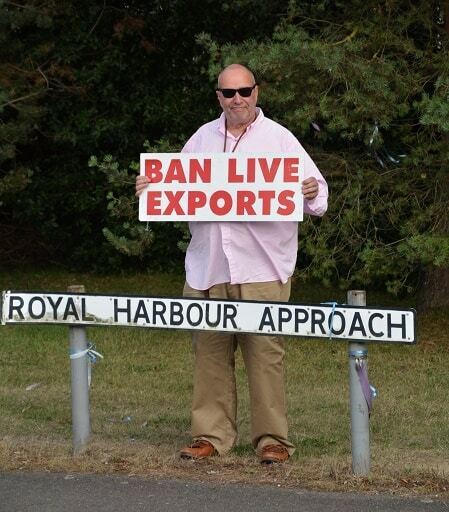 Once we have left the EU our MPs are answerable to the British electorate who do not want live animal exports. This was told to us many times , including CIWF, when I started campaigning against this trade 20 years ago. Teddy Taylor MP at the time wanted to do something to stop but his hands were tied by Brussels. So very sad for these poor creatures. They’ve done no harm to anyone , their crime ….to be born a sheep. So they are crammed into transport for days with no food or water or adiquate ventilation. Lots of them die during their journey. I don’t understand how any decent person could want this . I fully agree with all comments. This is worse than animals killed by halal methods. As they endure the terrifying journey and ordeal of being packed like sardines on a train. Power of the people, we can force a stop to this old trade.